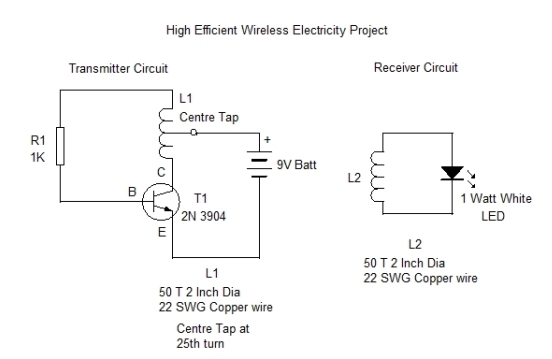 Here is a High Efficiency Wireless Electricity Generator project. 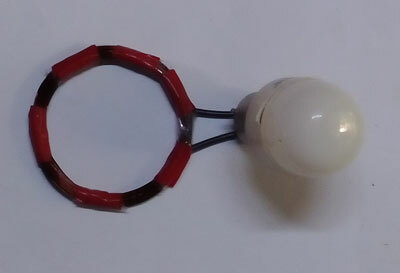 Usually we make a simple wireless electricity generator to light 1.8 volt Red LED. 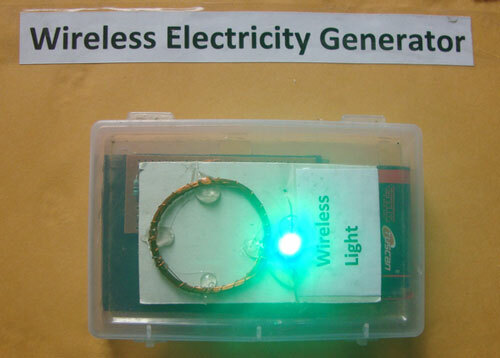 But here the efficiency of the Wireless Electricity Generator is increased to light 1 Watt White LED Bulb that requires 3.6V. 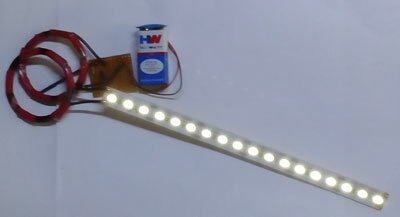 It generates voltage and current even to light a Strip LED. Try it and see the wonder of LED lighting without a battery connection. The first process is winding of two coils one for the electricity transmitter and another for the electricity receiver. The receiver coil consists of 50 turns having 2 inch diameter. I used a bottle to wind the coil. Remove the coil and make it intact by pasting cello tape. The Transmitter coil has a Centre Tap also. After winding 25 turns, make a loop and then wind the remaining turns. So the coil will have three leads – Start, Centre Tap and End. The main part of the Transmitter circuit is the NPN transistor 2N 3904 which is a high gain RF transistor. Connect one lead of the Transmitter coil to the Collector of transistor. Connect the other end of coil to 1K resistor. Then connect the other end of 1K resistor to the base of the transistor. Remove the insulation from the tip of the Centre tap and connect it to the positive wire of the battery snap. Connect the negative wire of battery snap to the emitter of the Transistor. The Transmitter circuit is ready. 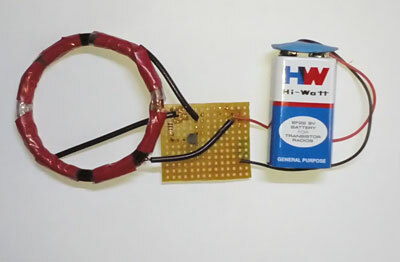 The Transmitter circuit is powered by the 9V battery. The High gain RF transistor2N 3904 and the coil works likes an Oscillator. This oscillation causes the generation of an Electromagnetic field around the Transmitter coil. Depending on the power supply and the turns of coil, the strength of EM field varies. In the given circuit, you will get more than 1 inch range. The Receiver circuit also has the similar coil with the connected 1 watt LED. When the Receiver coil comes close to the Transmitter coil, the EM field from the Transmitter coil induces current in the Receiver coil. 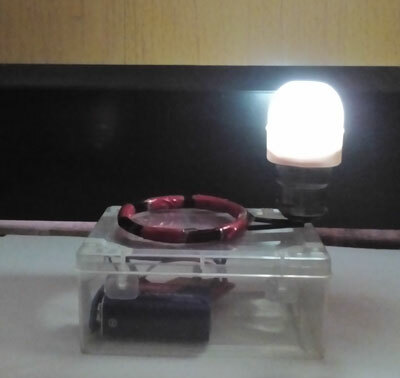 This current is strong enough to light the 1 watt LED. 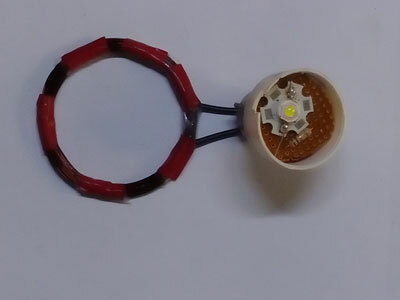 The LED itself acts as a rectifier, so it Lights just like connecting to a battery. You can use any high gain transistor like 2N2222 instead of 2N 3904.